Sterling silver and Alexandrite Topaz earrings. 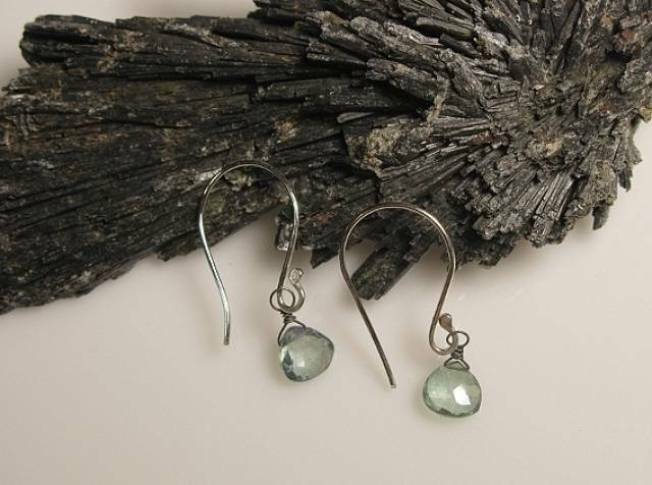 BEJEWELED: These handmade sterling silver earrings from Chicago’s Fab Studio Designs are crafted from Alexandrite Topaz. A nice, delicate venture from the come-hither statement pieces we’ve been lusting after all season. $58. Click here for a list of Chicago stores that carry Fab Studio. SPRING PREVIEW: Preview the Spring 2010 collection of haute couture designer Andre Laug at Saks Fifth Avenue Thursday from 10-5 at Designer Collections on the second floor. Call 312.944.6500 for more info. FALL FLING: The hand-knit cowl from Elise Bergman is a perfect addition for chilly fall days. We are told there are tons of ways to wear it so take your pick – a scarf, a headwarmer, a hood – even a skirt! Get it at Elise Bergman.